Is It Healthy to Share a Bed with Your Pet? Sleeping with a family pet could bring extra complications into the bedroom. It might be worth thinking twice before napping with your furry friend. To some people, the thought of welcoming a furry creature into their bed brings to mind images of filth, disease, and discomfort. But research suggests these folks are in the minority. Nearly 65 percent of American households own at least one pet, and 56 percent of those pet owners invite their critters to share their bedroom or bed. While the love we have for our pets is undeniable, the question still remains: Is sharing our beds with our four-legged friends okay for our health? As it turns out, the answer is pretty darn complicated. There are plenty of good reasons to kick Fido out of bed, but there are also plenty of good reasons not to. Hold onto your hats as we embark on a wild ride through the world of pet co-sleeping research. Many people who sleep with pets get less restful sleep, which means they may need to sleep for longer in order to get enough proper REM sleep. This is mainly because pets are likely to disrupt a person’s sleep throughout the night, whether because they’re snoring, hogging space, or fidgeting. Many people who sleep with pets toss and turn more throughout the night. This further degrades sleep quality and can contribute to neck and back pain. Many people who sleep with pets take longer to fall asleep and sleep less deeply throughout the night. This can lead to poor sleep quality and daytime sleepiness. People who have allergies (whether to dust, plants, or animals) may find that sharing a bed with a pet exposes them to more allergen triggers. Allergy symptoms, in turn, may make it harder to fall and stay asleep. People who have compromised immune systems (whether due to age or chronic illness) may be more susceptible to contracting diseases from a pet. 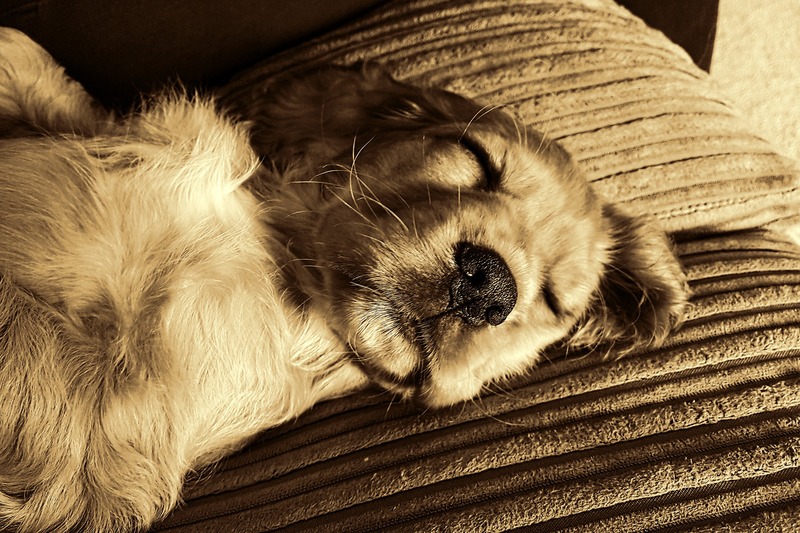 Why does it matter if a pet impairs your sleep quality? Countless studies have found sleep deprivation can degrade a person’s mental and physical health in pretty much every way imaginable, from impairing the immune system to causing irritability and poor moods, making it harder to concentrate or remember things, inhibiting problem-solving capacities, and diminishing work performance. While that might sound pretty damning, there’s no need to kick Scout out of the bed until you’ve also read up on why sharing a bed with your pet might be good for you. Most of the research in favor of sleeping with pets comes down to the fact that our pets can provide us with a sense of security, which can have a calming, stress-relieving effect as we try to wind down at night. The more we’re able to relax, the higher our chances of falling into a restful sleep. These effects are so powerful that there’s some evidence a canine companion can help people with insomnia enjoy better sleep without the use of medications. In fact, more than twice as many people say their pets help them sleep as opposed to impairing their sleep. Additionally, research suggests pets may not disturb sleep quality after all—provided they share the bedroom but not the bed. In other words, Fifi probably won’t wreck your sleep if she sleeps in her own bed beside yours. But the risk of diminished sleep quality does go up significantly if you welcome her into your bed. If you’re concerned less about sleep quality and more about germs, take heart: Research suggests the odds of catching a disease from your cat or dog are extremely rare—especially if you’re in good health. (As noted above, possible exceptions to this rule include anyone who is severely immunocompromised.) There’s even some evidence that exposure to the types of bacteria your critters carry around may boost the immune system. Ultimately, the question of whether or not to share a bed with your pet comes down to your specific situation. If your cat is bapping your face for hours each morning or your dog is taking up so much space that you can’t get comfortable enough to sleep, it’s probably time to kick your pet out of bed. But if you share a bed with your pet and don’t seem to be experiencing any adverse effects, many researchers now agree there’s no need to sleep sans your furry companion. Director of Content at Sleepopolis.com, trying to help people get a great night's sleep. Want Better Sleep in Your Bedroom? Use These 8 Tips!